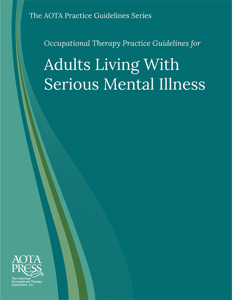 This Practice Guideline provides an overview of the occupational therapy process for individuals living with SMI. It is based on a systematic review process addressing five focused questions examining the evidence for occupational therapy interventions to promote ADLs and IADLs, rest and sleep, leisure, and social participation; support employment and education; promote health and wellness; intervene early after SMI diagnosis; and reduce internalized stigma. The guideline uses key concepts from the 3rd edition of the Occupational Therapy Practice Framework: Domain and Process and is essential for clinical decision making in occupational therapy practice with this population.